Pabst Blue Ribbon has a fascinatingly odd history. 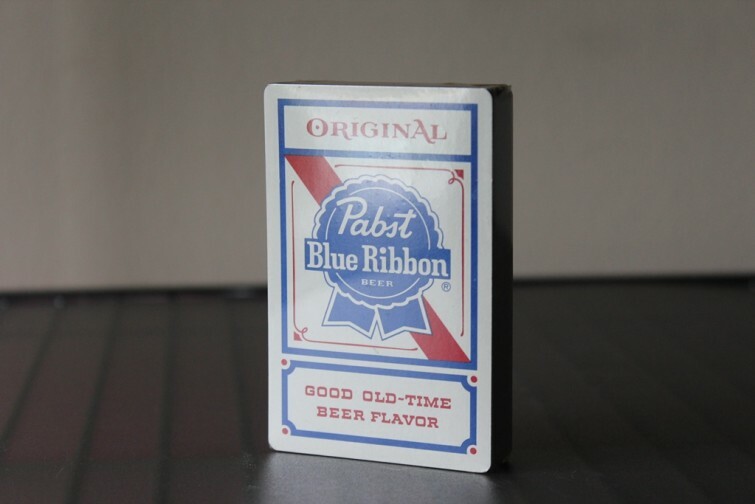 And being a fan of the company (more so than a fan of the actual beer), I was excited to find this pack of Pabst Blue Ribbon playing cards at a garage sale earlier this year. Pabst Blue Ribbon is a beer sold by Pabst Brewing Company, established in Milwaukee, Wisconsin in 1844 and currently based in Los Angeles. Originally called Best Select, and then Pabst Select, the current name comes from the blue ribbons tied around the bottle neck between 1882 and 1916. Pabst has a very unique relationship with urban youngsters and college students– mainly hipsters. While the company is not specifically open about marketing to this counterculture crowd, the popularity in hipster circles led to a sales revival in the early 2000s after a two decade-long slump. In doing so, Pabst targets its desired market niche through the sponsorship of indie music, local businesses, facial hair clubs (RVA Beard League), post-collegiate sports teams, dive bars and radio programming like National Public Radio’s All Things Considered. And of course it helps that PBR is generally one of the cheaper options of beer– a feature much appreciated by poor, thirsty college students. I found this pack of playing cards at a garage sale for 50 cents. I was able to sell it a few days later online for $30. Generally, Pabst Blue Ribbon merchandise is something I like to look out for when I’m picking. Old PBR-themed merchandise like old trucker hats, belt buckles, beer signs, food trays and lights have huge collectible value.